Independence Day: "Every life is a collaborative effort. Every one. In this country, we tout independence on a nigh mythic scale and tend to scorn people who are obviously not independent, but the truth of the matter is that no one is entirely independent." Her last post at Moving Right Along (posted in January 2009) was a show-and-tell about her newly decorated "subtle and elegant...funky and handcrafted-looking...totally original" leg, purple with "ars gratia artis" monogrammed upon it. Sara looked forward to wearing this leg during "shorts season." "I feel obligated to help those with spinal cord injuries realize their life's ambitions and be able to live life as independently and productively as possible, through education and employment opportunities.... I don't want to foster cure. I don't think that's a real thing to foster. For me, I'd rather foster and emphasize quality of life. I think that's more important.... research is important, [but] what do we do in the meantime?... I will never step up and step on the cure bandwagon, I'd rather be realistic, I'd rather live life the way life goes." I was out of town last weekend on academic business, but you know if I could I would have been at the debut of The Gimp Project by the Heidi Latsky Dance Company, March 19 - 21 at the Abrons Arts Center in New York City . Luckily Lisa Rose from The Star-Ledger (New Jersey) was there, and shared with us her video review - link. Enjoy! We'll be sure to let you know about future plans for this exciting work featuring well known disablity artist-activists Leslie Frye and Lawrence Carter-Long, but you can also follow the latest at their website. The universe of disability blogs used to be fairly easy to tour with some sense of coverage--now it's grown far beyond that possibility (for me, anyway). The same is true for podcasts about disability issues. I mostly manage to keep up with the Ouch! podcast (now in its fourth year, after 37 monthly episodes), but there are so many others, and new ones start often. The Dismodern Bodcast examines contemporary issues of the body, including normalcy and difference. The Dismodern Bodcast examines representations of bodily difference in order to understand how dominant culture uses rhetoric about the body for ideological and political purposes. This methodology disrupts what is often static, essentialist thinking about the human body in order to generate new ways of conceptualizing the body that are perhaps more inclusive and democratic. Two episodes are already available (one discusses bodybuilding, and the other anorexia); subscribe through iTunes if that works for you. 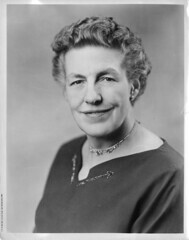 "Mary Elizabeth Switzer (1900-1971) was Director of the Office of Vocational Rehabilitation in the U.S. Department of Health, Education, and Welfare and co-winner of the Lasker Award in 1960 with Paul Wilson Brand (1914-2003), a missionary surgeon in Velore, and Gudmund Harlem, Norwegian Royal Minister of Health and Social Affairs. Switzer was known for her work on the 1954 Vocational Rehabilitation Act, which expanded services for people with disabilities." I am sure you are already following our news by subscribing to the Institute on Disabilities' RSS feed (;-), but just in case, I am posting this reminder for this week's 'Geo-politics of Disability' guest lecture on the Temple campus. James Charlton from Access Living, Chicago, IL (+ author of the key disability studies text Nothing About Us Without Us) will be on campus this week, discussing disability and neoliberal capitalism in a paper titled "Rage Against the Machine." Learn more about the lectures. Abstract: Individuals with disabilities having experienced lives of marginalization essentially alone for the past several hundred years. Ironically, in the same historical moment that people with disabilities became a (social) group, they became alone. Today, they are no longer alone as individuals but are essentially alone as a dispersed community. Then again, it could be said that they are a dispersed community even though segregated. Or possibly more ignominiously, their history of segregation and exclusion has made people with disabilities invisible. According to Charlton, one cannot know disability without recognizing its complex and perplexing particularities. Each paradox and contradiction illuminate what the vast majority of disabled people do to survive such a precarious state-of-being and what they must confront in order to transform it. "We traveled down the Italian boot until we came to that place--I had to disappear in the middle of the concert; in the dark I got lost, but I had to search. Far outside the city towards dawn, in the fields bathed by the morning dew, finally I found the place. But my arm wasn't there--only the poor peasant farmhouse was still standing in my place. They had brought me into it the day when I was shot in the right arm. They could never put it together again, and for years I was going from hospital to hospital..."
--Josef Sudek, describing a 1926 trip back to the site of his 1916 battle injury in Italy; found here. 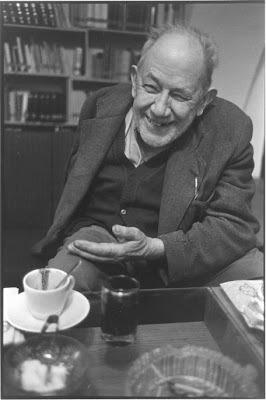 Born on this date in 1896, Czech photographer Josef Sudek. As a young man, he was apprenticed to a bookbinder, who may have been the first to introduce Sudek to photography. The year he turned 20, Sudek's right arm was amputated at the shoulder, after injuries and infection sustained in battle during World War I. Apparently he was given a camera during his convalescence in the veterans hospital, and found it agreed with his interests. Sudek studied photography after the war in Prague, while living on his Army disability pension. In 1924 he co-founded the Czech Photographic Society. Josef Sudek's work is considered neo-romantic, painterly, haunting. He created series that captured the light inside a cathedral, or the Bohemian woodlands, or panoramic Prague nightscapes. "I love the life of objects," he said. "I like to tell stories about the life of inanimate objects." His own crowded studio was the subject of another series, called "Labyrinths." Disability Blog Carnival #54 is up NOW! Go check out the March edition of the Disability Blog Carnival, freshly posted at Charming BB. It's a fine carnival: don't miss the poetry, grills, mini-golf... rudeness, fear, inaccessibility, hate speech online, segregation...and communication, advocacy, change, independence, community, and hope. The April edition (#55) is slated for April 9, at Yet Another Never Updated Blog (YANUB), with another potluck theme. So if you write something in the next few weeks that you want to submit, or if you read something new that you think more people should read, send the links for consideration. The blogcarnival.com form (except for that nasty inaccessible CAPTCHA feature), a link in comments here, or the words "disability blog carnival" in your post should do the trick. 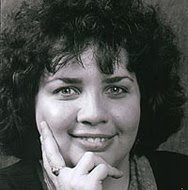 Sad news: Nancy Eiesland of Emory University has died this week, from cancer. If you're interested in how disability studies scholarship might inform the sociology of religion, you won't get far without running into some of Nancy Eiesland's work, especially The Disabled God (Abingdon Press 1994) and Human Disability and the Service of God (an edited collection, Abingdon Press 1998). Eiesland wrote last year in a campus publication about her lifelong experiences with surgeries and pain and medication, noting "for most of us, pain will be an ordinary partner in an ordinary life." Her colleague and friend Christian Scharen has this remembrance. According to the Facebook group "Friends of Nancy Eiesland," a memorial service is being planned for the afternoon of March 22, in Cannon Chapel on campus. Well, a Temple U. blog should certainly take note of a prominent deaf Philadelphian's birthday, no? Granville Redmond was born on this date in 1871, in Philadelphia. He became deaf after surviving scarlet fever when he was a very small child. Perhaps in recognition of young Granville's educational needs, his parents moved the family to San Jose, California, so the boy could attend the Berkeley School for the Deaf. Granville Redmond was a student at the Berkeley school for eleven years (1879-1890). He was found to be a gifted artist and encouraged to develop his talents at the school. After graduating, he attended the California School of Design in San Francisco, where he was an award-winning student. From 1893 to 1898, Redmond worked and studied in Paris. When he returned to the US, he went to paint beach scenes near Los Angeles, and married a deaf woman, Carrie Ann Jean. They had three children together. Redmond gained a solid reputation as California's first resident Impressionist painter. So what's with the photo above? Well, Redmond and Charlie Chaplin became friends in Los Angeles (a much smaller town then, of course). 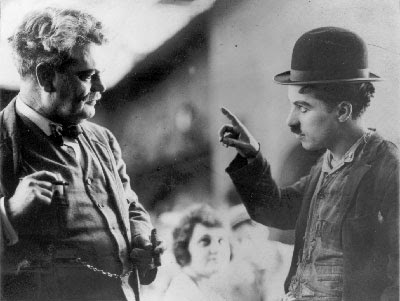 Chaplin, being a silent film star, was always interested in visual communication, and wanted Redmond to help him learn how ASL worked--which seems to be what's happening in the photo above. Chaplin also supported Redmond's artistic career--he set up a studio for Redmond on the film set, he bought Redmond's paintings, and he invited Redmond to appear in a few silent films, including the 1931 Chaplin classic City Lights (Redmond plays a sculptor). The Redmond/Chaplin friendship is also mentioned in Martin F. Norden's The Cinema of Isolation: A History of Physical Disability in the Movies (Rutgers UP 1994): 70-71. Interested readers can go see works by Redmond--mostly landscapes and seascapes--at the Irvine Museum, the Laguna Art Museum, and the Los Angeles County Museum of Art, among other collections. Thanks to Stuart Murray at Leeds University for making us aware of additional lenses through which British citizens are viewing the story Cerrie Burnell of the children's show Cbeebies. Together these might constitute something of a 'perfect storm' of interest in disability issues. One of our more popular television news anchors on this side of the pond (don't recall, but perhaps it was NBC's Brian Williams) shared with viewers his proclivity of reading the newspaper obituary section, which inspired him to note the Economist's notice of the death (and through it the life) of Christopher Nolan, of which he had otherwise not been aware. But there has been very little coverage of the sympathetic connection between Prime Minister Gordon Brown and David Cameron in our media (although see Beth Haller's post on Media Dis&Dat); I was only made aware of it by an English and an Australian participant at the New DEEL (Democratic, Ethical Educational Leadership) Conference held at Temple University this past Thursday through Saturday [conference; blog]. These two men included mention of this in their "Letters to World Leaders" as part of a morning plenary panel. My own presentation at the New DEEL conference, for the lunchtime panel "Democratic, Ethical Communities and the New Administration," reviewed the history of disability activision in the MidAtlantic region and and our current capacity building, designed to support the growth and raise the visibility of the disability community on and around Temple. [Watch this space for a link to the slides on Slideshare.com] In discussing the role that our senior instructor Carol Marfisi played in fighting with ADAPT for the passage of the ADA, I also pointed out that we can't know in advance what leaders and administrations might bode well for the advance of disability rights; after all, the Americans with Disabilities Act was passed and signed during George Bush Sr.'s presidency, only to be stripped of much of its teeth due to Supreme Court decisions during the Bill Clinton presidency. We also mourn the loss a very important local activist this week, co-founder of the Pennsylvania Education for All Coalition, Patricia "Trish" Creegan this week, to very aggressive form of lung cancer. She was taken far too soon, and yet we realize she would want us to celebrate her accomplishments and indominable spirit by getting back up and fighting for supports to that students with disabilities can take advantage of the wonderful resources of American universities like Temple. The net effect of these connections has been, I hope, to bring matters of disability supports and education FOR ALL firmly to the attention of our leaders. My further hope is that we will develop further connections with New DEEL activists as well.